My name is Xin Sheng and I was born in Taiwan. In 1978, I moved to the United States at age 19 accompanied by my parents. Afterward, to realize my entrepreneurial dream, I opened a retail auto parts store sponsored by my parents. However, it went out of business later for lack of sales channels. Along with that, my startup dream vanished. My parents often gave me attitude for the money loss and sometimes spoke to me sarcastically, asking me to pay their money back. I was so distressed. At that time, I thought of Pastor Yang and his wife whom I met when I was running my store. They served in a neighboring church and I had visited it several times at their invitation. I felt harmony and love and my heart was at peace there. Faced with my parents’ attitudes toward my failure and toward the loss of my business, I felt that my home was lacking in warmth and love compared with the church. So I wanted to stay in the church to calm my mind. There I was moved by the free help of Pastor Yang and his brothers and sisters to other people. They all abided by the teachings of the Lord and pursued to be good people. I felt it was a pure land in the world. Therefore, I turned to the Lord through baptism on Thanksgiving Day of 1981. Thank the Lord for visiting His blessings and profuse grace upon me thereafter. I got married in 1983. My wife and I left our parents and moved to a town in the middle of the United States the next year. I learned aircraft maintenance and repair at a school and meanwhile attended meetings at a Chinese Christian church. Except for workdays, my wife and I would serve in the church. Although it was a small church, there were many believers with fervent hearts and great faith. In 1986, I became an official aircraft maintenance worker and got a stable job. At the same time, my wife and I had our first child. My career and life went smoothly, which made me feel as if I had entered the good land of Canaan. I was happy with the presence of the Lord, often living in joy. In 1990, my wife came up with the idea of returning to Taiwan for spreading gospel to our families and building a local church. After prayer, we got back to Taiwan with our kids in 1992. At the beginning, there were few believers in our church. Through our constant efforts and cooperation with the local brothers and sisters, the church thrived in five years, burning like fire with an increasing number of believers. Everyone was following the Lord with the utmost confidence. Seeing that the church we established with consistent efforts grew ever better because of the Lord’s blessings, I felt joyous and thanked the Lord for His blessings and grace, and had a greater faith in following Him. Because of some changes in life, my whole family moved back to the United States in 1999. My wife and I decided to settle down here, expecting a new start. After coming back to America, we found the Charismatic Church and started to serve again, which brought us a new aim and knowledge. The pastor told us, “It is said in the Bible, ‘But the manifestation of the Spirit is given to every man to profit with. For to one is given by the Spirit the word of wisdom; to another the word of knowledge by the same Spirit; To another faith by the same Spirit; to another the gifts of healing by the same Spirit; To another the working of miracles; to another prophecy; to another discerning of spirits; to another divers kinds of tongues; to another the interpretation of tongues: But all these works that one and the selfsame Spirit, dividing to every man severally as he will’ (1 Corinthians 12:7-11). So we should pursue to be filled with the Holy Spirit, which is a spiritual gift. Only those who are filled with the Holy Spirit are the people possessed of spiritual life. It should be emphasized that everyone must pursue to gain the gift of praying in tongues, for the level of our spiritual life can be upgraded only with the gift of speaking in tongues. If we only pray with the understanding, the level of our spiritual life won’t be upgraded, and then it will be hard to say if we can enter into the kingdom of heaven when the Lord comes….” From then on, people in our church began to pursue various spiritual gifts, and those who gained the gift of speaking in tongues accounted for the largest proportion. I saw that once the pastor laid his hands on the believers and prayed, some cried, some laughed, some suddenly fell down, and some couldn’t stop speaking in tongues … My brothers and sisters always prayed in tongues after we finished singing hymns. But I was unable to do so. I supposed I was not a spiritual person. So I felt troubled for failing to gain any gifts, including speaking in tongues, which was the most common one. Feeling helpless, I just comforted myself with this: Don’t worry, maybe it is still early for me to gain spiritual gifts. Gradually, a growing number of the believers in our church could speak in tongues. But I saw that when my brothers and sister pursued spiritual gifts and the filling of the Holy Spirit, they paid decreasing attention to the explanation of the Scriptures and the practice of the Lord’s words, and all their deeds were far from testifying to the Lord. I remembered one time when my younger son came back from the church, he said, “I think the church is pretty much like the society. I don’t want to attend meetings anymore.” Actually, I felt the same way about the church. Gradually, I couldn’t feel the work of the Holy Spirit. I began to wonder whether or not the pursuit of being filled with the Holy Spirit was from Him. What’s more, every time we broke bread in Holy Communion, the church became a place of confessing. The moment the glasses of wine were raised, we began to repent our sins. But after that, we returned to real life and again committed sins involuntarily. The original prosperity of our church was lost and never returned. I was worried about living in sin and being unable to save myself. I tried to solve my problem through praying more, reading the Scriptures and spiritual books more, but to no avail. In particular, when I saw the Lord’s words, “Truly, truly, I say to you, Except a man be born again, he cannot see the kingdom of God” (John 3:3), my heart was full of fear and worry. I still lived in sin and was unable to put the Lord’s teachings into practice. I still could lose my temper, show jealousy and hatred toward others, have passions and lusts, and even tell lies for my personal benefits … I repented my sins, but after that, I continued to sin unwittingly. How could I be reborn in this way? I often thought to myself: If the pursuit of being filled with the Holy Spirit and receiving spiritual gifts is necessary for our salvation, why doesn’t the Lord bless our church? Can we really enter into the kingdom of heaven in such a way? I befriended Sister Fang on Facebook in November of 2016. In our conversation, I learned that her cousin was very seeking and that his knowledge and understanding of the Bible were very high. Then through Sister Fang, I got to chat with her cousin, Brother Qiancheng. Thanks be to the Lord. He indeed had a thorough and profound knowledge of the Bible, and I gained a new understanding of the Bible through his sharing. He also told me wonderful news that the Lord Jesus has come back. I was ecstatic and eager to know the work He has brought forth. However, when I heard him say, “The Lord has come back. He becomes flesh and expresses the words to do the work of judgment beginning with the house of God …” I felt conflicted and shocked: The Lord has come back through incarnation; how could it be possible? I believe that the Lord will appear to us with glory in a spiritual body instead of through incarnation when He comes back. Then Brother Qiancheng began to read the words of Almighty God. 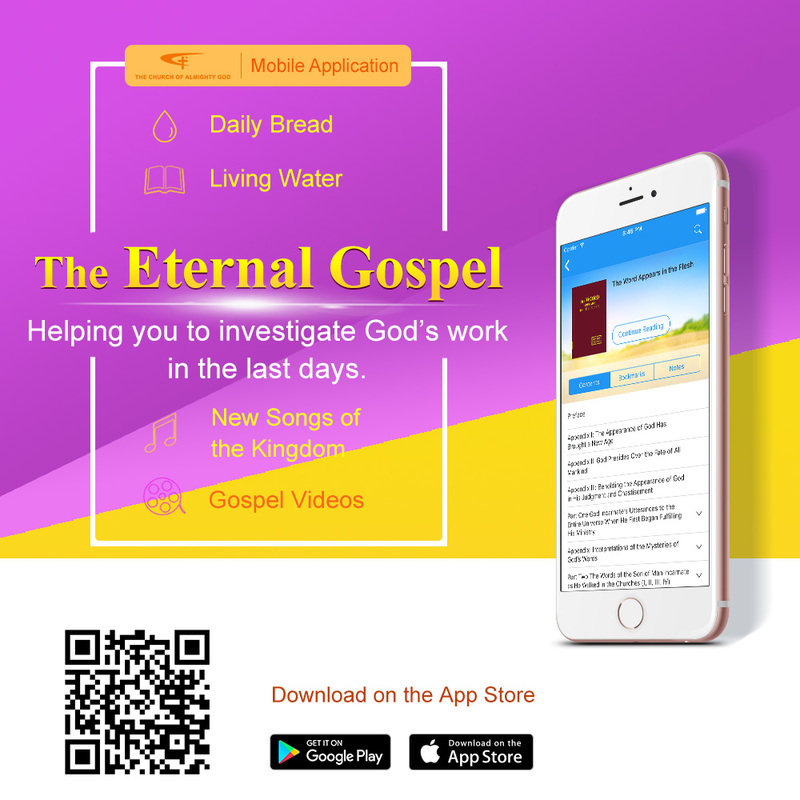 Almighty God says, “The Spirit is impalpable to man, and invisible to man, and the work of the Spirit is incapable of leaving any further evidence or facts of God’s work for man. Man shall never behold the real face of God, and shall always believe in a vague God that does not exist. Man shall never behold the face of God, nor will man ever hear words personally spoken by God. Man’s imaginings are, after all, empty, and cannot replace the true face of God; the inherent disposition of God, and the work of God Himself cannot be impersonated by man. The invisible God in heaven and His work can only be brought to earth by God incarnate who personally does His work among man. This is the most ideal way in which God appears to man, in which man sees God and comes to know the true face of God, and it cannot be achieved by a non-incarnate God” (“Corrupt Mankind Is More in Need of the Salvation of God Become Flesh” in The Word Appears in the Flesh). “So if this work is done by the Spirit—if God does not become flesh, and instead the Spirit speaks directly through thunder, so that man has no contact with Him, would man know His disposition? If only the Spirit does the work, then man would have no way of knowing His disposition. People can only behold God’s disposition with their own eyes when He becomes flesh, and reveals His words in the flesh, and expresses His entire disposition through the flesh. God truly lives among man. He is tangible; man can truly engage with His disposition and what He has and is; only in this way can man truly know Him” (“The Vision of God’s Work (3)” in The Word Appears in the Flesh). “The work that is of greatest value to corrupt man is that which provides accurate words, clear goals to pursue, and which can be seen and touched. Only realistic work and timely guidance are suited to man’s tastes, and only real work can save man from his corrupt and depraved disposition. This can only be achieved by the incarnate God; only the incarnate God can save man from his formerly corrupt and depraved disposition. Although the Spirit is the inherent substance of God, work such as this can only be done by His flesh. If the Spirit worked single-handedly, then it would not be possible for His work to be effective—this is a plain truth”(“Corrupt Mankind Is More in Need of the Salvation of God Become Flesh” in The Word Appears in the Flesh). Brother Qiancheng’s fellowship was very practical and beyond all dispute, making me up from my stupor. As it turned out, God’s work has a very profound meaning. But I would always define it according to my own conceptions. I was too ignorant and arrogant. Indeed, we are caked in grime, living a life of sinning and confessing. How could we be fit to see God’s spiritual body? Only when God is incarnated as a man as well as work and speak among us, can we hear His voice with our own ears, read His words, experience His work personally, and come face to face with Him. Just when the Lord Jesus did His work, His disciples were face to face with Him every day, listened to His preaching, and accepted His personal provision, watering and shepherding. The work of God incarnate is so beneficial to man. Then Brother Qiancheng read two more passages of God’s words, “It is precisely because Satan has corrupted the flesh of man, and man is the one who God intends to save, that God must assume the flesh to do battle with Satan and to personally shepherd man. Only this is beneficial to His work. The two incarnate fleshes of God have existed in order to defeat Satan, and have also existed in order to better save man” (“Restoring the Normal Life of Man and Taking Him to a Wonderful Destination” in The Word Appears in the Flesh). “When God is working in the flesh, He is actually doing battle with Satan in the flesh. When He works in the flesh, He is doing His work in the spiritual realm, and makes the whole of His work in the spiritual realm real on earth. The one who is conquered is man, who is disobedient to Him, the one who is defeated is the embodiment of Satan (of course, this is also man), who is in enmity of Him, and the one who is ultimately saved is also man. In this way, it is even more necessary for Him to become a man who has the outer shell of a creature, so that He is able to do real battle with Satan, conquering man, who is disobedient to Him and possessed of the same outer shell as Him, and saving man, who is of the same outer shell as Him and has been harmed by Satan. His enemy is man, the object of His conquest is man, and the object of His salvation is man, who was created by Him. So He must become man, and in this way, His work becomes much easier. He is able to defeat Satan and conquer mankind, and, moreover, is able to save mankind” (“Corrupt Mankind Is More in Need of the Salvation of God Become Flesh” in The Word Appears in the Flesh). God’s words and Brother Qiancheng’s fellowship made me gain further understanding of God’s work in the last days. God becomes flesh to do His work for the purpose of saving man that has been deeply corrupted by Satan. Without the work of God incarnate, man would never be supplied and shepherded by God’s words, and would be unable to gain the truth to break away from the influence of Satan or free himself from sins. In that case, man would always be controlled and exploited by Satan, always live under Satan’s domain, and belong to Satan forever. Therefore, God incarnate expresses the words to provide to man and shepherd him, allows him to break away from Satan’s influence and become a man who truly belongs to God and is gained by God. This is profound salvation for man and great love for him. It was almost time for my work. Then we all got offline after setting up a time for our next fellowship. I was contemplating God’s words and Brother Qiancheng’s fellowship on my way to work. Almighty God’s words have indeed unveiled mysteries and clarified the significance of incarnation. God is so practical. He becomes flesh as the Son of man, expresses His words and judges the corruption of mankind really and actually. In the past, I believed that the Lord would appear in a spiritual body when He came back. It now looks as though my thought is so vague and impractical, neither is it realistic. However, concerning Brother Qiancheng’s fellowship that people who have gained the truth have received life, I have a different understanding. It is agreed in our Charismatic church that people have gained life when they are filled with the Holy Spirit, or when they get spiritual gifts like speaking in tongues or interpreting tongues. But I have learned something from this fellowship and dare not uphold myself. I prefer seeking out him for fellowship online next time. He said, “Concerning this issue, the first thing we need to understand is what constitutes life. The Lord Jesus has said, ‘I am the way, the truth, and the life’ (John 14:6) and ‘The words that I speak to you, they are spirit, and they are life’ (John 6:63). Almighty God says, ‘the more you obey the words of God, the greater the proof of your longing for the truth. People who do not long for the words of God are people who are without life. Such people are those who are outside the words of God, and who belong to religion’ (‘Only Those Who Know the Work of God Today Can Serve God’ in The Word Appears in the Flesh) and ‘Why is it said that many people have no life? Because they do not know God, and thus it is said that they have no God, and have no life. 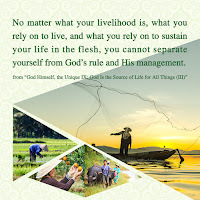 If your belief in God has reached a certain point where you are capable of thoroughly knowing the deeds of God, the reality of God, and every stage of God’s work, then you are possessed of the truth’ (‘Only Those Who Know God Can Bear Testimony to God’ in The Word Appears in the Flesh) and ‘When you are having a change, the reality of the truth is being wrought in you, and you will then progress and will see a change in the conditions of your life. When you have this change, and this kind of reality of the truth, then you will have stature, and with stature comes life’ (‘If You Wish to Attain the Truth, Then You Must Learn From the People, Matters, and Things Around You” in Fellowship and Preaching of Christ of the Last Days). From what is said above, we can see that God’s word is the life and the truth is the life. It can be seen that only those who have gained the truth and the word of God as their life are those who truly have life and those who are perfected by God’s work of judgment in the last days. In God’s work of judgment, people are able to understand and gain the truth, live by God’s words, have a true knowledge of God, understand His will in all things, be truly loyal and obedient to Him, and truly love Him, revere Him and shun evil. All of these show that they have received the life. People possessed of the life can prevail over Satan. They can penetrate Satan’s deception instead of falling prey to it, no longer rebelling against or resisting God, regardless of how Satan deceives, tempts or tests them. Thus it is erroneous that people want to gain life through pursuing to be filled with the Holy Spirit. In addition, the Holy Spirit is God Himself and will never become man’s life. The Lord Jesus and Almighty God are the fleshes in which the Spirit is realized, the incarnate God Himself, which is nothing less than the absolute truth. Apparently some people still live under the bonds of sin and what they live out is entirely the image of Satan, but they say the Holy Spirit has become their life, which is a tremendous blasphemy to God. I gained discernments through God’s words and Brother Qiancheng’s fellowship. People from the sect pursue to be filled with the Holy Spirit and to gain spiritual gifts with the result that some can speak with tongues and some can interpret tongues. This is abnormal and is simply not the work of the Holy Spirit but the work of evil spirits. Because man’s living out can show that man still lives in sin, covets money and the pleasure of the flesh, seeks fame and fortune and pursues worldly trends. Not a single one can hold fast to God’s commandments, abide by the Lord’s way, let alone overcome Satan’s temptation. How could this be having life? Even some people see the display of crying, laughing and falling on the ground in great meetings as the manifestations of having life. Thinking about it now, that is so absurd and ridiculous. I thank God for preparing the online gathering, making me gain a lot of knowledge which is far more than what I have learned in the past couple of years in the religion. It not only rectifies my former mistaken knowledge but also makes me have discernment and see through the absurdity in the religious world. The words of Almighty God are indeed the truth that can supply the life of man. From now on, I will read His words more and equip myself with the truth so that I can become clear of mind and bright of eye and have a path upon which to tread. In the days after this, we continued with the online gatherings in fellowship. After reading the words of Almighty God, Brother Qiancheng communicated with me about various truths, such as the mysteries of God’s incarnation, the significance of His two incarnations, the differences between the work of the Holy Spirit and the work of evil spirits, the differences between the work of God and the work of man, the prophecies of the kingdom’s beauty and so on. I firmly believe that this is God’s voice and the work of God’s appearance and become convinced that Almighty God is the returned Lord Jesus. I happily accepted the work of Almighty God in the last days. Thereafter I enjoy the words expressed by Almighty God every day. I hope to become a person with the truth as my life soon. I give thanks for Almighty God’s salvation for me.